Jon Deutschle had no intention of becoming a professional chef. Like most young men in Ohio, he dreamed of playing for The Ohio State Buckeyes. He then planned to take the NFL by storm as the most accurate and powerful kicker they’ve ever seen. However, after graduating from Newark High School, he realized he needed to find a real job. His friends convinced him to join them as a server at a local restaurant, and he soon discovered that he was on the wrong side of the kitchen line. By age 21, Deutschle was teaching himself how to cook by watching PBS cooking shows and watching others around him in the restaurants where he worked. He made his way through a few more restaurant jobs, gaining more experience at local Columbus restaurants. Deutschle joined the Cameron Mitchell Restaurants (CMR) family in 2007. Through his hard work and dedication, he quickly rose through the kitchen ranks at Marcella’s and was named Executive Chef in 2010. 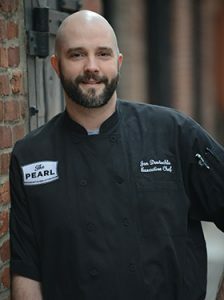 He currently serves as the Executive Chef at The Pearl. Deutschle’s advice for aspiring chefs – “If you want to be the best, you have to work harder than the best.” He also likes reminding them that food shouldn’t be overcomplicated because, after all, it’s just food. He loves to cook for his biggest fans, his family. Though Deutschle’s favorite cooking style is Mexican, he says he likes to make something new every time he cooks. And there is always a steady supply of dried chilies, Kosher salt, and at least three different kinds of hot sauces in his home kitchen. When he’s not in the kitchen, Deutschle enjoys relaxing with his wife and children. He’s also an avid sports fan, with a particular love for The Ohio State Buckeyes and the Cincinnati Reds.